If you have never seen the original version of SkyBlock and would like to understand what it is then the post will be useful to you. 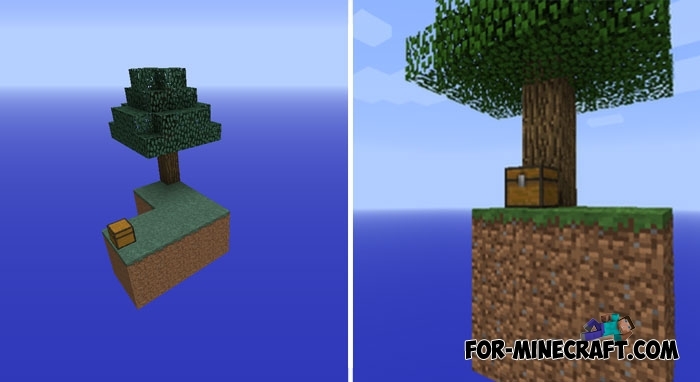 Skyblock is not only the name of the map, it's a whole genre that sends you to a tiny island in the sky. This island is so small that you can easily calculate the number of blocks it consists of. Chest is an indispensable SkyBlock attribute, storing several important items (do not lose them). Skyback does not have any specific purpose, you must survive and explore the next islands. Correctly allocate resources and think about each step otherwise the consumed things will cost you very dearly. The map is planned in such a way as to remind the player of such needs as hunger and complex crafting. A simple crafting table is quite an expensive block on this map, do not waste resources on various nonsense.